The construction of slab on ground requires certain basic design elements. These design elements must be enlisted and added in the contract documents by the designer in charge before asking for a bidding. The Materials required for base and the sub – base preparation. The vapor retarder can be provided if necessary. The details of joints and their locations. The type of reinforcement if necessary. The type, size, detailing and locations have to be specified. The details of pre – construction meetings, the details of overall quality assurance and quality control. 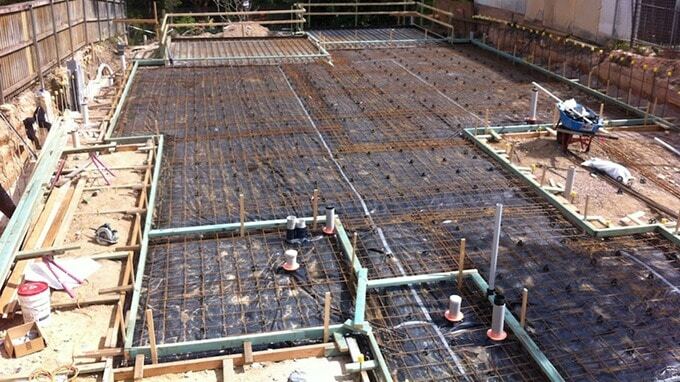 The construction of a concrete slab on the soil demands the soil to behave like a standard supporting system. Hence the performance of a slab that is constructed on the ground is dependent on the integrity of the slab and the soil – support system. This requires high preparation of the site as per the desired requirement of loads. Mostly the soils undergo proof rolling. The method of proof rolling well help us to know whether the full layer of soil is able to behave as a supporting system i.e. whether they are uniformly stable and have adequate bearing capacity so that they perform well after the whole construction of slab. It is recommended to have this procedure just after the rough grading and before the placement of the slab. To control the thickness of the concrete and to have a reduction in the friction between the base material and a slab, a thin layer of fine grading material is used. This fine grading material can be graded, granular and a compatible material. The details of the materials used is explained in ACI 360R. The slab constructed above the ground is highly subjected to moisture penetration if no proper treatment is carried out. The moisture protection is provided for the floor over the slab by means of flooring materials like wood, carpet, linoleum, vinyl, impermeable floor coatings, adhesives, rubber – backed carpet tile. These are moisture sensitive flooring materials. This is mainly applied for floors that are installed in a moisture sensitive environment or refrigerator rooms where it is humidity controlled. To minimize the transmission of moisture content from the below to the floor surface, vapor retarders can be used. The ASTM E 1745 provides the performance requirements of a plastic vapor retarder that must be used in practical applications. Generally, a permeance value that is less than 0.3perms must be gained by the vapor retarder employed as per ASTM E 96. The materials used for this protection must comply with the specification given in ASTM E 1745 and the minimum thickness is 0.25mm. If an increased thickness is provided, the moisture penetration and hence the durability is increased after the complete installation. A true vapor retarder is as specified by ASTM E 96 that have a permeance equal to 0.00 perms. Many designers have been employing and referring wrong materials as vapor retarders. The lap that is employed in the installation of vapor retarders must be 150mm as per ASTM E 1643. This can also be based on the measurement recommended by the manufacturer. The joints and the penetration after the installation must be sealed properly by the sealants, or by pressure-sensitive tapes or as it is instructed by the manufacturer. 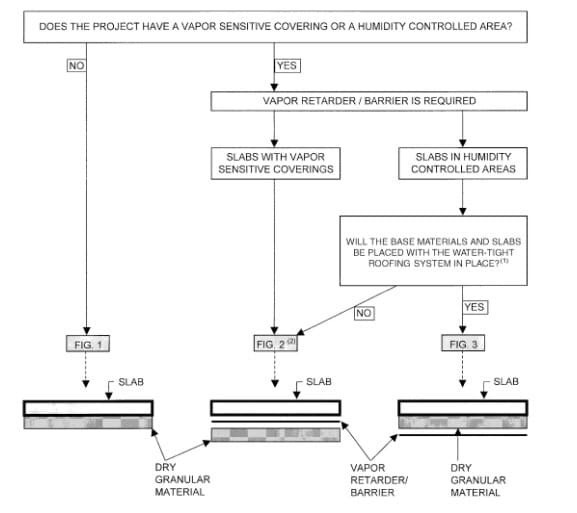 The decision on where to place the vapor retarder will vary from site to site. The vapor retarders can be placed either in contact with the slab or it can be placed in contact with the granular fill. In the case of a moisture sensitive environment, the concrete can be placed directly in contact with the vapor retarder material or the barrier that is used for moisture penetration. This method will help in the penetration of moisture and water from the potential sources like rain, curing, cleaning or saw-cutting. The saturated fill, when placed above the vapor retarder, will consume time for the slab to dry up. As mentioned in above method, the placing of concrete in direct contact with the vapor retarder will demand high quality considerations. 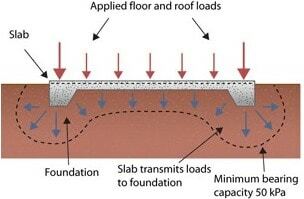 Only proper installation can help in avoiding slab related issues during the performance period. It has been observed that the placement of concrete directly over the vapor retarder when compared to other slab installation methods are subjected to length change, drying shrinkage and other related effects from the environment. Settlement is also observed. The design detailing of the concrete must incorporate these considerations so that the restraints are reduced. The standards recommend to follow each site to perform this construction must be separately evaluated for the sensitivity towards moisture of the floors, the project conditions and the effects due to slab curling, cracking and crusting. All the benefits and risks that are anticipated must be discussed with the appropriate parties before the commencing of the construction. The figure-3 below shows a flow chart that will help in assisting the evaluation and construction. Fig.3. A decision flow chart to assist the decision of vapor retarder or the barrier. From the figure-2, the FIG.2 is employed if the granular material is subjected to future moisture infiltration. The decision of FIG.2 will ask for a concrete mix design that is of low shrinkage, reduction for joint spacing and all other properties that would minimize the curling of the slab. Inadequate consolidation of the concrete, use of bars of large diameters, inadequate concrete cover provided for the reinforcement, higher temperature of the employed reinforcing bars, higher slump value than desired, inappropriate curing or the combination of the above-mentioned factors are the main reasons behind the formation of cracks near to the reinforcement installed in slab constructed on ground. The use of reinforcement in a non-structural member is performed to control the width of the cracks that will occur in the concrete slabs. The reinforcement mainly used will be steel bars deformed, welded wire reinforcing, post tensioning tendons or the steel fibers. These reinforcements can also be used in combination. Mainly, the non-structural concrete slab mainly employs a small amount of reinforcement that they do not have any role in the restraining movement caused from the volume changes. The slab on ground that are not reinforced will experience temperature and shrinkage cracks. These are observed wider at the surface of the concrete slab and will narrow throughout the depth. The reinforcing steel or the post-tensioned steel or the deformed steel have to be supported and tied together while installing in concrete. This is to ensure that their movement during the concrete placing is avoided. The required support can be given by pre-cast concrete bars. The precast concrete bar employed for this purpose must have a thickness of 100mm in minimum value and have a compressive strength equal to the concrete used in the slab. When using welded wire reinforcement, it is essential that the contractor provides sufficient support so that placing of the concrete does not affect the reinforcement drastically. Proper support at adequate locations must be provided so that pulling out of the wire reinforcement is avoided during foot traffic. The use of steel fibers won’t bring a reduction in the amount of cracks formed in the concrete slab constructed in the ground. The steel fibers used near to the contraction joints helps in the reduction of joint openings. This helps in the reduction of chances of cracking between the joints. The crack width must remain narrow. The concrete slab casting will sometimes welcome plastic shrinkage and their cracks during the first few hours of curing. This can be reduced to some extend by the use synthetic fibers of polyethylene, nylon, polypropylene and other types. These fibers also help in the reduction of segregation of concrete in the plastic state. The modulus of elasticity will get increase when the concrete gets hardened. A relatively high compressive stress is induced within the concrete, using high strength steel tendons. This is used instead of conventional mild steel reinforcement and the steel fibers. This post tensioned slab will have compressive stress that can balance all other undesirable stress caused after the placement of concrete and when the load is applied. This hence reduces the crack formation on the slabs. It is recommended that the construction loads on the concrete slab have to be fully minimized until the slabs are fully stressed. This type of work must be done only by experienced contractors and engineers. How to Control Deflection of Reinforced Concrete Beams and Slabs?